Telltale Games isn't ready to release the fourth episode of their Walking Dead adventure game just yet. However, to tide everyone over, they've sent out a lone screenshot that shows Clementine in danger. Walking Dead follows escaped convict Lee Everett and a group of survivors as they try to find safety during the zombie apocalypse. In Episode Four, the group reaches the city of Savannah. They're hoping to find Clementine's parents there, along with a boat. As usual, though, this plan won't go as smoothly as the survivors hope. 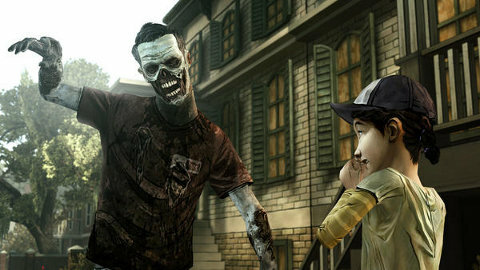 Lee has been the surrogate guardian of Clementine throughout the series. The lone screenshot, which shows Clem being attacked by a zombie, is obviously quite concerning then. It would be devastating to see her die after such a long journey. "So many people threatening to hunt me down if Clem is harmed in Episode 4. I love that people care this much about her," tweeted episode writer Gary Whitta. Telltale plans to release Episode Four sometime in October. The fifth and final episode will follow shortly afterward. The full "season" will then be released on a disc in December.